I know many entrepreneurs, and have worked for several highly successful ones, but I have always known that I could never hope to become one myself. Anyone who has ever met me will have recognised immediately that I lack the requisite energy and ‘never give up’ determination. But, above all, I lack the basis killer instinct to make a buck whenever the opportunity arises. 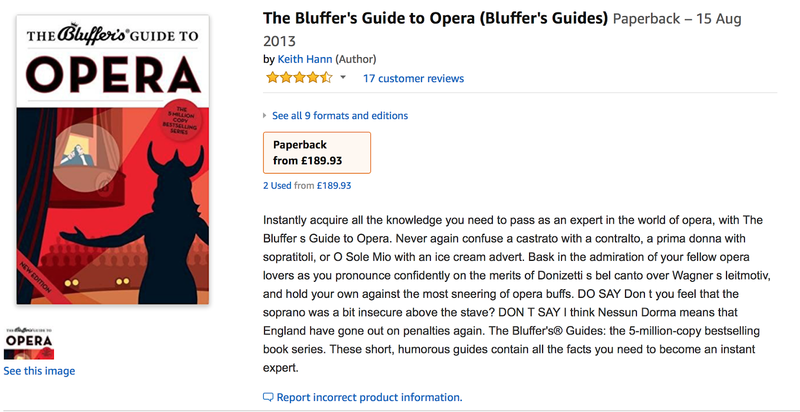 I had forgotten that The Bluffer’s Guide to Opera is out of print. (There is a new edition, from a new publisher, coming out in June.) Consequently some chancer, sorry entrepreneur, was taking the opportunity to try to shift a copy for an eye-watering £189.83. My response on Twitter was instantaneous. Come to me and I will sell you one for the cover price of £6.99. I even felt a bit guilty about this, because I enjoyed a 50% author’s discount when I bought them. It took me several hours to realise that anyone with an ounce of business sense would have tried to knock them out on Amazon at £189.82. Sadly, I simply haven’t got the trader’s mentality. My one undoubted and entirely theoretical commercial success was in the far bygone days when I used to travel overseas, and would invariably attract envious glances from my fellow tourists as I became a magnet for absolutely amazing offers in every street market we visited. The stallholders having mistaken my total lack of interest in ever buying their carpets or whatever for the possession of world class haggling skills. I have had an eBay account for years, but never sold a thing, despite currently being in possession of two houses positively groaning at the seams with unwanted tat. This includes a large collection of vintage model railway equipment that I have been repeatedly assured was a strongly appreciating asset through the 1980s and 1990s, but is now more or less worthless. I can follow the logic of the dealers and auctioneers: this sort of thing was collected by men (and only men) who were children in the 1950s, prosperous in the closing years of the century, but are now dying or downsizing. Understandably enough, there is no one else motivated by nostalgia to buy it from them. Every time the desired items come up on eBay I add them to my watch list, and adopt my proven strategy of bidding extremely late and unpredictably high. Yet every time I do it I find myself outbid, usually by a substantial margin. So clearly someone is out there, in defiance of all logic, paying Big Money for old Hornby Dublo. As usual in life, things are only head-shakingly worthless when I am the seller. By the same token, perhaps there really is someone on this planet mad enough to pay the thick end of £200 for an old edition of my Bluffer’s guide. I shall find out when my career in corporate affairs comes to its inevitable and surely imminent close, and I am thrown back on selling stuff to try and sustain my family. Come on. I’m not asking £189.83. I’m not even asking £189.82. It can be yours for just £150 (plus postage and remarkably expensive packing) and I won’t even devalue it with my signature.